Are you looking for a unique Florida vacation that will allow you to enjoy all the natural beauty and charming culture of the Sunshine State? Want to enjoy beaches, theme parks, shopping, and much more? For your vacation this year, rent a Florida vacation apartment at Tropical Resort & Marina, centrally located for all kinds of Florida fun! Tropical Resort & Marina has a variety of accommodations to choose from, including studio apartments, RV hookups, and hotel suites with one, two, or three bedrooms. Amenities include laundromat, pool, campground, boat rentals and ramp, and a snack shop. With the convenience of a fully furnished apartment, it's easy to relax on this beautiful property with waterfront location and old Florida charm. 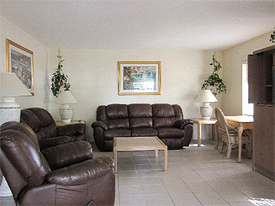 So, what should you look for in a Florida vacation apartment? Tropical Resort and Marina is conveniently located close to many central Florida vacation hot spots, but with a quiet charm you won’t find anywhere else. Enjoy swimming, surfing, long walks on the beach, quaint art galleries, and shopping in any of nearby beach towns (New Smyrna Beach, Daytona Beach, or St. Augustine, to name a few). Combine that with our shady campsites, delightful amenities, and access to wild Florida, and you’ve got a match made in Heaven! Nature trails, hiking, and fishing await you at Tropical Resort and Marina, on the beautiful St. Johns River, in Deland. Tropical Resort & Marina is the “natural” choice for the discerning Florida vacationer: Enjoy the wildlife, recreate on the St. Johns River, and take in the charms of Deland on your next Florida vacation! Choose one of our rental apartments or other accommodations as your Florida vacation ‘home base,’ and you won’t be disappointed! Ready to look for the perfect Florida Vacation Apartments?